Delivering effective low carbon policy for small and medium-sized enterprises (SMEs) is necessary to meet climate change targets. 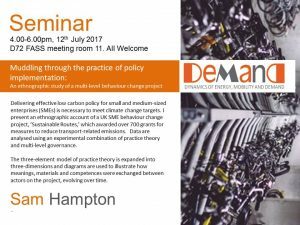 I present an ethnographic account of a UK SME behaviour change project, ‘Sustainable Routes,’ which awarded over 700 grants for measures to reduce transport-related emissions. Data are analysed using an experimental combination of practice theory and multi-level governance. The three-element model of practice theory is expanded into three-dimensions and diagrams are used to illustrate how meanings, materials and competences were exchanged between actors on the project, evolving over time. Sam Hampton is a PhD student at the University of Oxford.